Americans sometimes think the rest of the world escaped the economic challenges they faced in 2008. It just isn't so. Iceland epitomized the most startling rise and fall of all. And there is a film about it, but not one that is being covered by any major critics in America (probably because it's funny). It goes like this. Although its population was smaller than Wichita, Kansas, Iceland had grown so rich that its assets were nine times greater than its entire economic output. By October of that year, its three biggest banks owned a combined $62 billion in foreign currency debt before they were taken over by the Icelandic government because the impending collapse nearly dragged the country down with it. 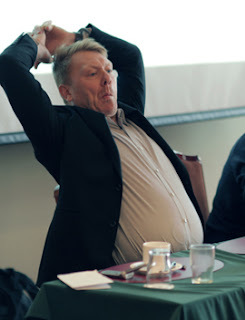 Enter Jon Gnarr. The least likely mayor of Reykjavik. His campaign promises immediately captured attention. All kinds of things for the unfortunate. Disneyland in the Vatnsmyri area. Toll booths on the border with Seltjarnarnes. No more debt, mediocracy, or boring people. Sustainable transparency. A drug-free parliament by 2020. He came up with most of those on his own, but he didn't campaign alone. Under the banner of his newly created Best Party, Gnarr was joined by indie artists and punk rockers, including one from the alternative rock band Sugarcubes. This led to one of the most brilliant campaign concepts, turning Tina Turner's song "Simply The Best" into the Best Party theme. While the Best Party started as a joke inside the head of Iceland's most cynically dry comedian, it didn't end that way. The idea to poke fun at the establishment resonated as Gnarr parodied the "left" and "right" parties for what he called a false morality. They were ridiculous. Not only did Gnarr win the seat, but the Best Party swept the elections. It took six of the 15 council seats, more than any other party. In a single day, the voters of Reykjavik expressed how fed up they were with the status quo of politics, and delivered an extraordinary upset. In fact, some beaten politicians remained unconvinced Gnarr could "actually" serve, even after the win. 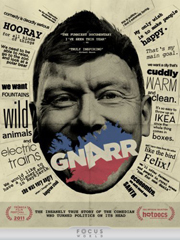 The film, aptly named Gnarr, captures it all, sort of. Although there are snippets of the opposition's opinion throughout, the narrow point of view focuses on Gnarr and his campaign, starting with some initial footage of him announcing his candidacy via his computer. At the onset, Gnarr says his qualifications could be summed up as living in Iceland all his life, working a number of years in a psychiatric ward, and "almost" completing his maritime certificate, which would have allowed him to captain a small boat. Oh, and he was licensed to drive a truck. How the brilliant idea fits within the confines of the film. As a film, Gnarr is a little less comedy than it is Andy Kaufman-esque performance art. Gnarr is committed to his character, but without overtly grandiose pranks or hoaxes like Kaufman. Unless, of course, you consider the entire campaign a grand hoax as some of his opposition did. For those unfamiliar with Kaufman, the quirky cult film Napoleon Dynamite might suffice as a baseline, but without any awkward teen oddity to carry it forward. But that is not to say any parallels to either Kaufman or Dynamite should be misconstrued that Gnarr is on par with them. It only means it is difficult to tell where the dry and often deadpan comedy begins and ends. In that regard, the subtitled film captured by director Gaukur Ulfarsson and producer Sigvaldi J. Kárason compels you to watch as it climbs to its quirky sub-comedic level and maintains a plateau there throughout. You would think a political film would have builds and climaxes, but this isn't like that. It's one long sustained note. Sure, there are moments it earns some laugh-out-loud chuckles, especially when Gnarr crosses the international lines of political correctness or makes absurd promises like giving unemployed people the chance to have their pictures taken with Mickey Mouse. But then there are also moments when the jokes are grounded in truth, like the real reason behind his promise to provide free towels at city pools. Perhaps that is what makes it all the more unfortunate that the film never really comes together as a cohesive story. Instead, it plays all right as a collection of loosely woven clips and subtle gags in mostly chronological order. So while the film is certainly worth watching and not is boring, it never lives up to the brilliance of the concept behind what really happened. Gnarr Shakes Iceland; The Film Rattles At 3.1 On The Liquid Hip Richter Scale. This will likely be one of those films I love, but will still find it hard to recommend without some reservation. The film isn't brilliant. But the idea that sparked the film was genius. As funny as Gnarr can be, he rides right up to the truth in saying that you don't have to be serious (and boring) to make things better. Gnarr is available to rent or own on iTunes. You can also find Gnarr on Amazon. If spry and dry humor is your bag, don't let the lack of consumer reviews frighten you off. Gnarr is just getting started, assuming it gets a start as a subtitled indie film that resonates anywhere. We all need a Best Party.